OTTAWA - A national inquiry into missing and murdered indigenous women will come a step closer to reality today, as the Trudeau government wraps up consultations on how best to conduct an in-depth examination of the issue. 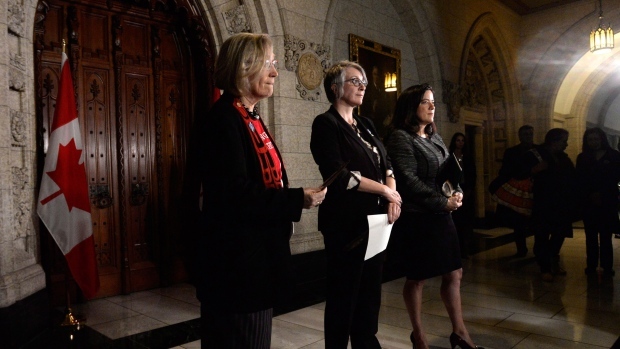 Indigenous Affairs Minister Carolyn Bennett and Status of Women Minister Patty Hajdu are to wrap up consultations with a final meeting today in the nation's capital. The pair has been on a cross-country tour since early December to meet with the families of murdered or missing aboriginal women and girls, seeking their input on what a national inquiry should look like and what it should attempt to accomplish. Bennett said last week they've heard from 1,300 people, many of whom believe police have ignored their concerns about missing or murdered loved ones. The federal government hopes to have the inquiry up and running by the summer but it must first decide what the inquiry's mandate should be. Bennett said it requires a balancing act to ensure the inquiry's focus isn't too narrow or too broad. A 2014 report by the RCMP concluded 1,017 aboriginal women had been murdered between 1980 and 2012, and that another 164 were considered missing. Indigenous women make up 4.3 per cent of the Canadian population but the report found they account for 16 per cent of female homicides and 11.3 per cent of missing women. Former Conservative prime minister Stephen Harper resolutely refused to launch a national inquiry into the issue, arguing that indigenous women need action, not more studies. However, Prime Minister Justin Trudeau promised during last fall's election campaign to immediately launch an inquiry as part of his bid to establish a new "nation to nation" relationship with indigenous peoples.